One of the things that I've found difficult since becoming a writer, is that I find it very difficult to read without critiquing. I'm always looking for ways a text can be improved and the only time I've found myself able to just relax and enjoy the read has been in the hands of the masters. Stephen King. George RR Martin. Brandon Sanderson. And now, Jennie Ensor. 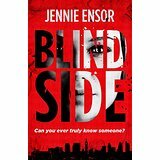 Blind Side was a fantastic read, with very little room for improvement. From Amazon: London, five months before 7/7. Georgie, a young woman wary of relationships after previous heartbreak, gives in and agrees to sleep with close friend Julian. She’s shocked when Julian reveals he’s loved her for a long time. The central question of this novel is: How well do you ever really know someone? And the answer is , not well. With twists and turns galore, it seems that no-one in this book is exactly what they seem. The characters are well-developed and complex with many shades of grey. I'm not normally a fan of first-person, present-tense narrative but in this case it works very well. Events move at a pace that drags you along and I had trouble putting this book down. You can really feel Georgie's confusion as she tries to figure out the people surrounding her and, although I felt that she blamed herself too much for other people's bahviour, I understand that many people are guilty of that. I'm really glad that I had the opportunity to read this book and I'll be first in line to pledge my support for the next book from this author.